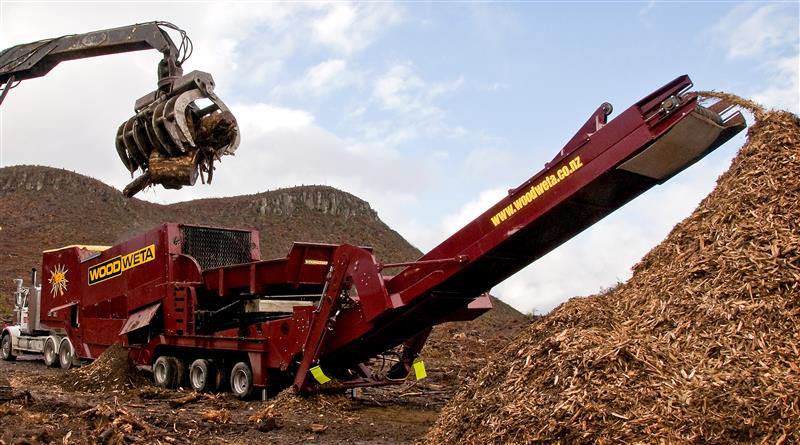 The award winning WoodWeta 560hp (418kW) wood and greenwaste shredder has been designed to produce optimum product in one pass, with high production and low wear and fuel consumption. The machine is built tough with high quality components to give excellent reliability and durability. If the WoodWeta 560 is larger than your requirements, the WoodWeta 330hp machine will produce 30 to 40 cubic metres (1060 to 1415 cubic feet) per hour or up to 40 tonnes (44 US tons) per hour, depending on product and size. This machine can be towed by a 6 wheeler truck. Optimum Product - unique design and easily interchangeable grates ensure that optimum product is produced in consistent size. Optional dirt wear can separate unwanted fines from white wood. One pass - no need to waste time pre splitting or rescreening your product. The WoodWeta can process any material from 1 metre stumps through to twigs in one single pass. No difficult material - no need to separate out fibrous plants, such as palm trees, rubber trees or flax. These can be processed along with any other wood or green waste. The WoodWeta also easily processes materials such as fillet wood or reject laminated board. High production - high speed rotor and low speed screens give optimum production output. Depending on product size, the WoodWeta 560 produces 200 cubic metres (7000 cubic feet) per hour or up to 100 tonnes (110 US tons) per hour. Low wear - large surface screen area separates out fines and material already to size, so only material that needs shredding will contact the screens, rotor and teeth, reducing wear. Low maintenance - patented tooth design allows teeth to be easily reversed or replaced, reducing downtime. Low fuel consumption - large slew drum bearing reduces draw on the engine, giving fuel savings. Vertical Plane Rotor design ensures maximum contact with minimum drag. Safe and quiet - with no projectiles and lower sound decibels, the WoodWeta can operate in urban areas with these restrictions. Large outfeed conveyer - 1200mm (4 ft) belt allows low belt speed and less wear. Adjustable discharge height of 5 to 6.1m (16.4 to 20ft) allows filling of bin trucks or large piles. Transport options - WoodWeta designs allow either towing by tractor unit or pintle hook to suit your machinery. A ring feeder system is also available as an optional extra. 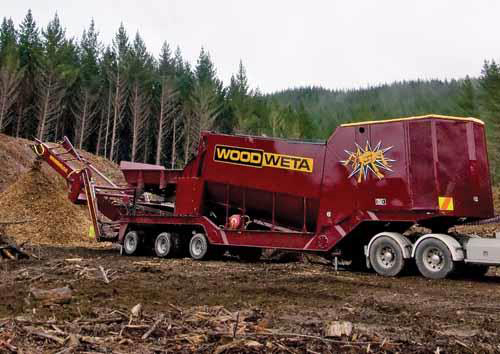 “The WoodWeta is the most suitable and fastest machine that I have seen on a whole range of wood based material.” Don Ford, Norske Skog Tasman & Energy Co.